There are 4 species of Asian carp that threaten the Great Lakes. Bighead and Silver are considered by many to be the most dangerous threat to the ecosystem. Read about all 4 by clicking the links below, and also find out about the Common carp, a non-native fish that can already be found all over the Great Lakes. The Ontario Federation of Anglers and Hunters manages the Invading Species Hotline (1-800) 563-7711. If you find or catch a suspected Asian carp, please report it without delay. Learn about what is being done to stop Asian carp (2018, focus to Grass carp) from entering the Great Lakes. 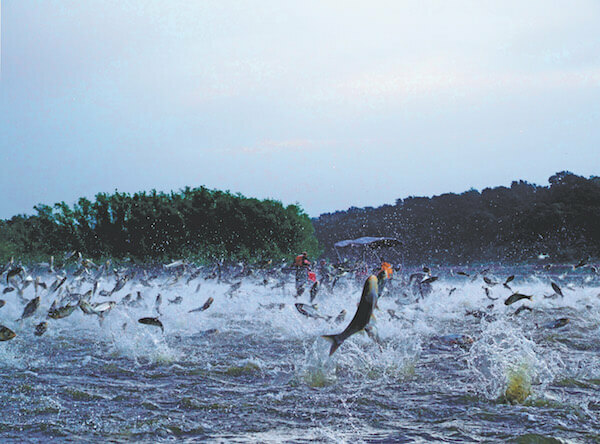 If you want to explore further, skim this 2016 Article on Asian carp. Diet: Zooplankton, small organic debris and small invertebrates. Huge appetite - lack a true stomach, so need to feed continuously. How was this introduced? Generally, brought in to control plankton in aquaculture ponds, historically part of the live food fish trade. How did they escape into the wild? Generally, from flooding in the 1990s, made way to Mississippi River system. Finds in the Great Lakes: None. Key Issues: Ability to cross breed with Silver Carp. No natural predators so the food they consume is not available to other organisms as energy. Reduces food, shelter and spawning areas for native fish as they are able to eat up to 20% of their body weight each day. Colouration: Dark grey above, cream coloured below with dark great to black blotches on back and side. Preferred Habitat: Spawning - Medium to large rivers, or deeper then 2 m lakes with slow current. More lively in cold water, feed at temps + 2-4 ° C, prefer 4-26°C. Adaptable to many freshwater conditions. 1. This information is largely extracted from www.asiancarp.ca . Further great information, and great pictures and representations can be found there. 2. A source for purpose and finds was Becky Cudmore, from Fisheries and Oceans Canada/Pêches et Océans Canada. Asian carp are a major threat to native species and biodiversity. The University of Toronto analyzed Asian carp characteristics that determined their high potential to survive and thrive in Canada. Tiny organisms suspended in water that could consist of the following: single cell alga and other unicellular organisms, small crustaceans, and eggs and larvae of other animals. Plankton are typically eaten by filtering the water. Diet: Young eat mostly zooplankton and later insect larvae and other organic debris. Adults eat mollusks. How did they escape into the wild? Unclear, perhaps through flood, or maybe misidentified in Grass Carp Stockings. Colouration: A lengthened look verses the other species, brown to black in body colour, bluish grey to white on belly. Fins are dark brown/black or black with light hues at base, scales give a crotch hatch appearance. Preferred Habitat: Lower reaches of river and lakes, spawning at high turbulence. Even though Black Carp eat mollusks, there is no evidence to date that these species would be an effective control against zebra mussels. Not a strong threat now..
Black carp is not nearly as established and prolific in the Mississippi River yet, and therefore not as much of a threat as the other three types. Although we can't ignore them. In February 2016, the Missouri Department of Conservation reported on evidence of the wild reproduction of Black Carp in North America. Diet: Phytoplankton - lack a true stomach, so need to feed continuously. How was this introduced? Generally, to control plankton in aquaculture ponds. However, there are incidents that cause concern about their possible movement closer. According to www.asiancarp.us "On June 18, 2015, three Silver Carp larvae were collected, approximately a mile-and-a-half upstream of the I-55 Bridge (Channahon, Illinois), in the Dresden Island Pool of the Des Plaines River (River Mile (RM) 279.3). These individuals ranged from 8.5 – 10.0 mm (0.33-0.39 inches) total length. Asian carp eggs (either Silver or Bighead Carp) were also identified from samples collected from Marseilles and Starved Rock pools of the Illinois River, as well as from downstream pools (LaGrange and Peoria). These detections are within areas that Bighead and Silver Carp have historically been captured; however, this is the first collection of larval fish upstream of Henry, Illinois (approximately 90 miles downstream on the Illinois River from this detection location in Dresden Island Pool). No additional Asian carp larvae were collected in this 90-mile stretch of the Illinois River in 14 sampling visits from April 27, 2015 to September 14, 2015." Key Issues: Ability to cross breed with Bighead Carp. Vibrations in water cause fish to jump up to 3 m (9ft) from water. Boat propellers can trigger. Hazard for water recreation No natural predators, so the food they consume is not available to other organisms as energy. Reduces food, shelter and spawning areas for native fish. Lack a true stomach with a very poor functioning digestive system, so need to feed continuously. Colouration: Silver with slate grey head and dorsal surface, white belly. Preferred Habitat: Still waters of rivers, canals and lakes - tolerates water temps from 6 to 28 °C. Diet: Aquatic plants, but also can eat small organic debris, insects, small fish, earthworms, other vertebrates if plant material is not available. How did they escape into the wild? No information. If you come across some research, please advise. Finds in the Great Lakes: 2013 - 2 triploid (can't reproduce) Grand River, 2014 - 1 triploid in Grand River, 2015 - 2 diploid (fertile males in Tom Thompson Park Toronto, August - 1 diploid male in Jordon Harbour, Sept - 2 diploid males, 1 diploid female Toronto islands, 1 triploid bay of Quinte, 1 dead specimen in Niagara. Analysis showed that these fish did not originate in the Great Lakes. Generated concern: Six 1year-old Grass Carp were captured in the Sandusky River, a tributary of Lake Erie in 2012, and USGS has determined that the six fish had no overlapping parentage, indicating a potentially large population of spawning fish. Key Issues: Break down approximately 1/2 plants they eat, the rest is discharged into the water - contributing to nutrient enrichment (threat of algal blooms). Lack of natural predators, means that the food they consume can not be used as energy for other organisms. Reduces food, shelter and spawning areas for native fish as they are able to eat up to 40% of their body weight each day. Colouration: Large cycloid scales, colour ranges from blackish to olive brown with brassy or silvery-white on sides and belly. Scales give off cross-hatch effect. A major difference between Grass carp and Silver and Bighead carp is their diet. 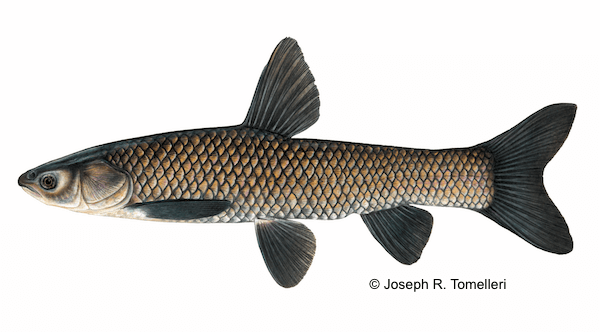 Grass carp are not big plankton eaters, they eat aquatic plants. For this reason, these fish are considered the least destructive of the Asian carps. However, it's large appetite, constant foraging in the sediment, and high nutrient waste generation are disruptive to wetland habitats and water quality. What is a Diploid fish? The fish is fertile. How was this introduced? Sometime in the 1800s, via Europe cost likely for food aquaculture. Much money is spent, especially in the US to destroy harmful populations, as they they are not overly coveted for food or for recreational fishing in North America, and impact native ecosystems. How did they escape? One reference in Wikkipedia, states that they go into the Great Lakes in 1896 when the area near Newmarket, Ontario, flooded and allowed them to escape into the Holland River. Finds in the Great Lakes: . Established all through the Great Lakes. Issues: High reproductive rate. Method of feeding creates murky cloudiness via foraging into bottom sediments, which leads to disturbing and demolishing underwater vegetation. Like Grass Carp, they also expel significant undigested material which can lead to increased nutrient levels, which are linked to excessive algae development. They eat other fish eggs and can ruin their nests. 2. A source for purpose and finds was Becky Cudmore, from Fisheries and Oceans Canada/Pêches et Océans Canada. 3. 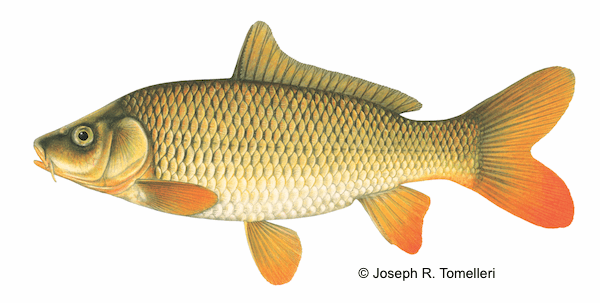 Wikkipedia.Common Carp. 4. www.great-lakes.net. Invasive carp. 6. Reference: What is a Triploid Fish? Https://nrm.dfg.ca/gov/FileHandler.ashx?DocumentID94602. Retrieved March 11, 2016.